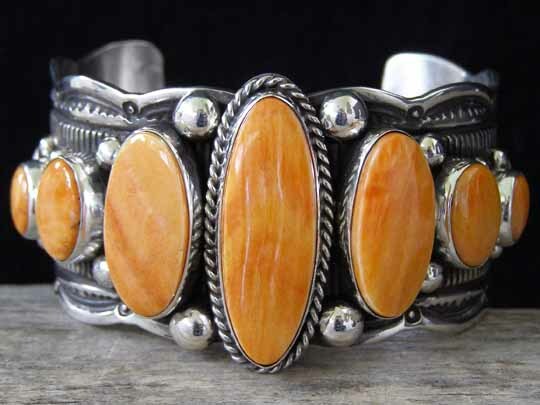 Guy Hoskie Orange Spiny Oyster Graduated Row Bracelet size 6 1/4"
Here is a beautiful set of seven rich orange cuts of spiny oyster brought together in a scalloped-edge row bracelet. These well-matched ovals are polished to glassy smoothness and beautifully complemented by deep-stamped traditional stampwork motifs. The center elongated oval is wrapped with twist wire and graduated raindrops are interspersed between the settings for additional dazzle. This piece is quite simply cheery by virtue of its rich, bright color! Orange spiny oyster: center 1 3/8" x 7/16"; left & right 15/16" x 7/16"; middle left & middle right 1/2" x 3/8"; far left & far right 3/8" x 1/4"
Width of cuff: 1 3/8"